It is designed to encourage them to use their reserves to lend to businesses in an attempt to counter Japan's economic stagnation. The charge does not directly apply to ordinary customers' accounts. One of the side effects of a moribund economy is falling prices - something that can send an economy into a downward spiral as customers hold off spending in the hope prices will fall yet lower. Is deflation such a bad thing? 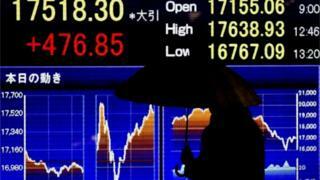 It is a move that has been on the cards for Japan's stagnating economy for well over 10 years. The decision to go negative came after a narrow 5-4 vote at the Bank of Japan's first meeting of the year on Friday. "The BoJ will cut interest rates further into negative territory if judged as necessary," the Bank of Japan (BoJ) said, adding it would continue as long as needed to achieve an inflation target of 2%. The Bank of Japan is imposing a negative interest rate on accounts it holds for commercial banks. It will start to charge them for looking after their cash. The European Central Bank and a few others are already doing it. But the Bank of Japan's negative rate is going to bite very gradually. The amount affected will build up over time. The move does not directly affect savers. They don't have accounts at the central bank. But certainly their banks could decide to pass on the cost they in turn will face as the impact of the negative rate accumulates. So perhaps in time savers will in effect be paying to keep their money at the bank. So they would have more of an incentive to spend. In a press conference, the BoJ's governor Haruhiko Kuroda said the weakening growth rate of the global economy was the main factor behind the move: "Japan's economy continues to recover moderately and the underlying price trend is improving steadily... further falls in oil prices, uncertainty over emerging economies, including China, and global market instability could hurt business confidence and delay the eradication of people's deflationary mindset." Earlier in the day, fresh economic data had again highlighted concerns over economic growth. The December core inflation rate was shown to be at 0.1% - far below the central bank's target. The decision to implement a negative interest rate has been dubbed "Kuroda bazooka" after the governor of the Bank of Japan. So today's announcement caused the stock market to jump while the yen fell sharply against major currencies. The option of lowering the cost of borrowing below zero has been on the cards for Japan's central bank since the early 2000s and it was the first in the world to consider it. "Negative interest rates are one of the last instruments in the BoJ's tool box," Martin Schulz of the Fujitsu Institute in Tokyo told the BBC. "But their impact is unlikely to be strong." "In Japan, credit didn't expand not because banks were unwilling to lend but because businesses didn't see the investment perspective to borrow. Even with negative interest rates, this situation will not change." "Businesses don't need money - they need investment opportunities. And that can only be achieved by structural reforms, not by monetary policy," he said. The decision comes in addition to the BoJ's massive asset-buying programme, which over the past years has failed to boost growth. Bill Blain, of Mint Partners, said monetary authorities' moves to ever-cheaper money since the financial crisis that began in 2008 have distorted global markets - and investors were uneasy: "Investors are worried that the only place we've seen any inflation has been in financial assets, things like stocks, property and bonds. And as a result everyone is suddenly worried they are sitting on nightmares."